MORE than 1,200 visitors from as far away as America and Australia were welcomed to Tavistock Parish Church’s first Summer Festival, last week. Celebrating St Eustachius’ 700th birthday, it showcased groups from the church and associated ones, set amongst themed floral arrangements. Historical displays included clerical vestments, silverware and memorable photographs, while others reflected future hopes and aspirations. Organiser Pam Hunter said: ‘The Summer Festival has been a great success in many ways. 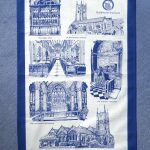 Many people have commented most favourably on the various displays and particular interest was shown in the old photos and history of the church; added to all of that we have raised £1,250 towards church funds’. 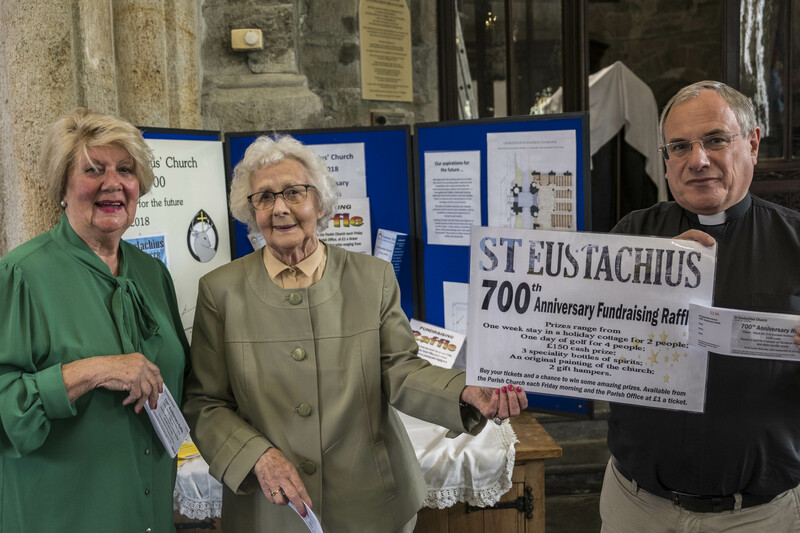 Thanking joint organiser Hilary Sanders for her “constant support” and other helpers, she said: ‘It has been a truly wonderful celebration of 700 years of St Eustachius’. 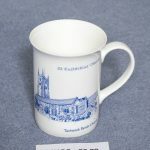 WHEN it comes to raising funds for Tavistock Parish Church, Edna Bennallack is a winner every time. 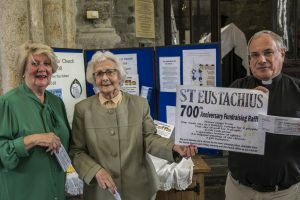 Edna, who is in her 80s, has helped raise thousands for St Eustachius’ over the years but is reticent about taking all the credit. She said: ‘I have had a lot of help from various people and my friends. My daughter, Karen Frontera has been doing all the bits and pieces – advertising, artwork and posters and contacting people. 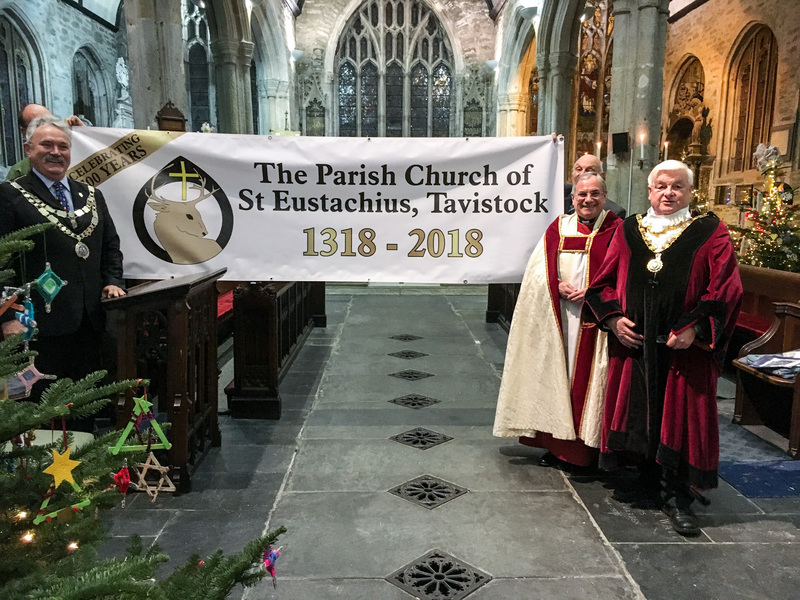 Proud to be a Church of England member since five years old, Edna, from Tavistock, is a church steward at St Eustachius’ and a familiar face welcoming visitors to its annual Christmas Tree Festivals. Prizes for the 700th Anniversary Raffle, which include a Week for 2 in a Cornish Holiday Cottage, a Round of Golf for 4 at Tavistock Golf Club and £150 cash, will be drawn at a special buffet lunch at the Parish Centre on 15 September. Party Mood at Parish Church’s 700th Anniversary Dedication Festival. 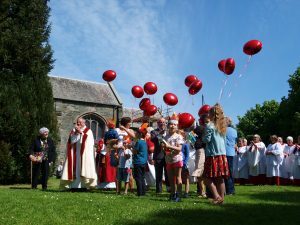 BALLOONS and a specially iced cake helped to mark Tavistock Parish Church’s Dedication Festival on Sunday 20 May, which celebrated 700 years since the foundation stone was laid in 1318. 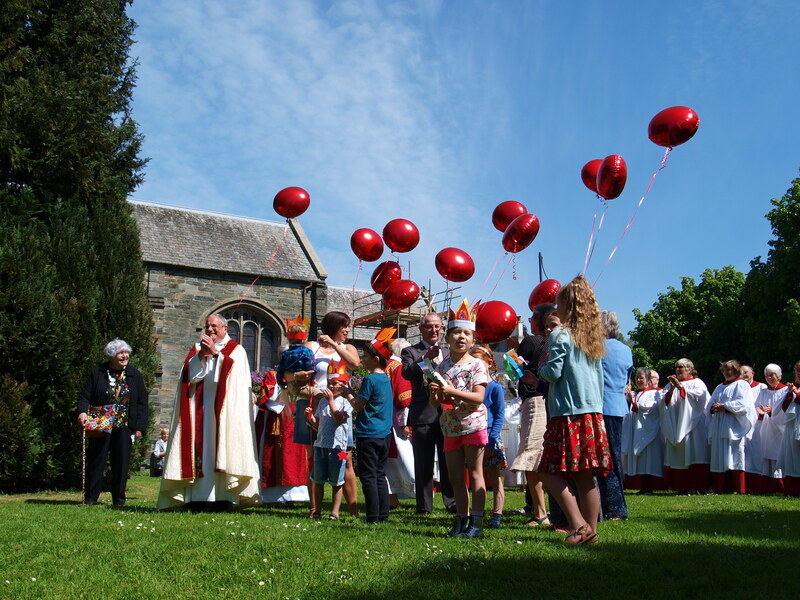 In party mood red hydrogen balloons lined the nave for the service and afterwards the congregation moved into the churchyard to continue the celebrations. This landmark event also celebrated The Day of Pentecost. The service was central to a weekend of celebrations, which included a recital by award-winning organist Richard Lester on Friday, a 700th anniversary concert performed by the church choir and guests, on Saturday night, and a Festival Evensong on Sunday. On Monday evening, to mark the Day of Consecration, the church bell ringers rang a Quarter Peal on St Eustachius’ ten bells. An illustrated talk by the Reverend Dr Steven Martin, exploring what happened on the day of consecration followed. 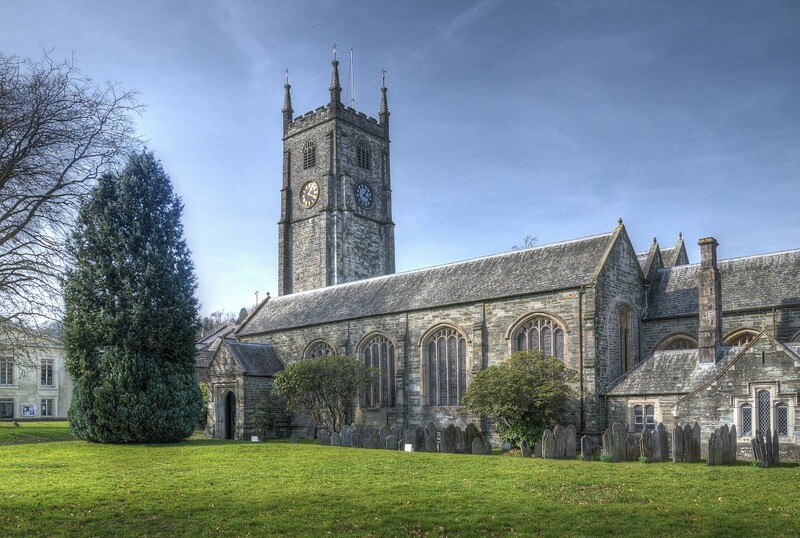 Weekend of Celebrations Marks Tavistock Parish Church’s 700th Anniversary. A weekend of celebrations to mark the dedication and consecration of St Eustachius’ Parish Church, Tavistock, begins on Friday, May 18 with an organ recital by the acclaimed concert organist Richard Lester. Starting at 1 pm, his programme will include works by Bach, Couperin and Messiaen. On Saturday (May 19), the Choir of St Eustachius’ will present a 700th Anniversary Concert, beginning at 7.30 pm. The music will include Vivaldi’s “Gloria”, Rutter, Walton, Parry and Bruckner. Steven Martin directs, accompanied by Andrew Millington, former Director of Music at Exeter Cathedral. On Sunday morning (May 20) everyone is invited to a Dedication Festival Eucharist led by St Eustachius’ vicar, the Very Reverend Dr Christopher Hardwick, starting 9.45 am, and to a Festival Evensong at 6 pm. On Monday evening St Eustachius’ bell ringers will ring a Quarter Peal, under the direction of tower captain, George Mudge, starting at 6.30 pm. The church’s peal of ten bells will echo around the streets of Tavistock for about an hour. At 7.30 pm the Reverend Dr Steven Martin will give an illustrated talk exploring what happened on the day of Consecration of St Eustachius’ Church 700 years ago, entitled “On This Day in 1318”. The talk is part of the church’s 700th Anniversary Lecture Series. A free 700th Anniversary ‘Guide to Events’ booklet is available at the back of the church. at the Tourist Information Centre and Tavistock Post Office. It can also be viewed below this article. All events listed above are free, with a retiring collection in aid of church funds. The Parish Church of St Eustachius has published a 700th Anniversary Guide to the concerts, events and special services taking place in your Parish Church during our 700th Anniversary year. This guide can be viewed below or, alternatively, use the Upcoming Events section on the home page where each event is shown together with details of the event. 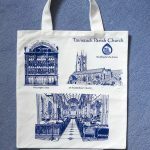 These can be obtained in the church when the stewards are on duty (3 April onwards from 10.30 am – 4.30 pm) or from The Cabin situated on Bedford Square. 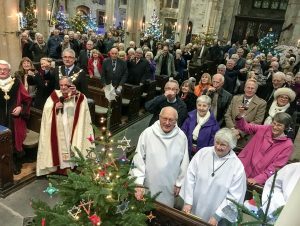 WORSHIPPERS toasted the launch of Tavistock Parish Church’s 700th anniversary following its Advent Carol Service on Sunday 3 December. 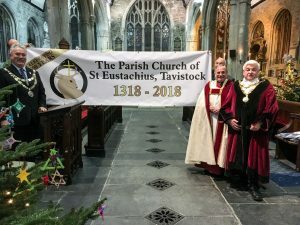 Glasses of mulled wine were raised by members of the congregation, which filled three-quarters of St Eustachius’ Church and included town mayo r, Cllr Philip Sanders and West Devon mayor, Cllr Jeff Moody. 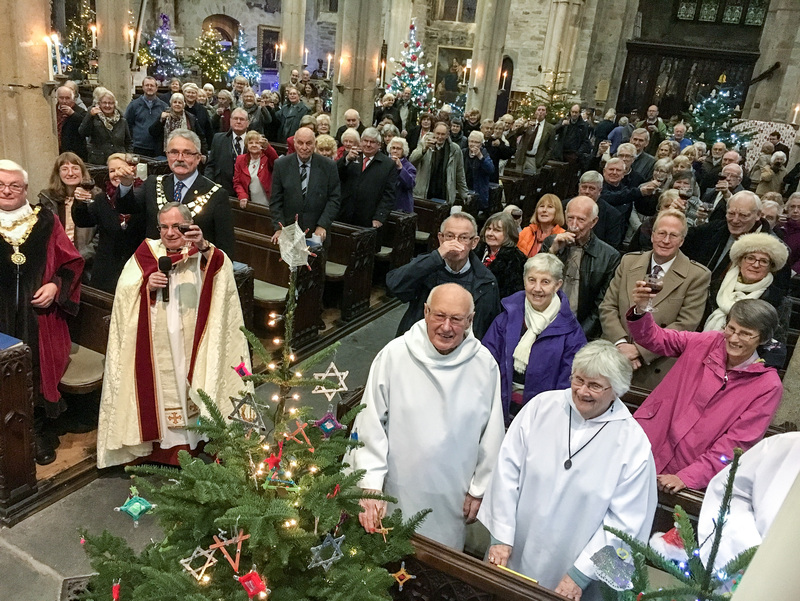 The candlelit service of readings and carols was festively set with 65 decorated trees glowing as part of the ninth annual Christmas Tree Festival. 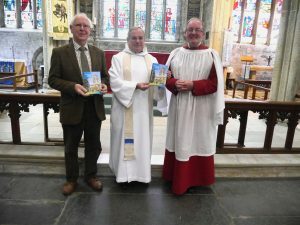 Vicar, the Very Rev Dr Christopher Hardwick shared the church’s plans for a year of anniversary celebrations and introduced a new, illustrated guide book of the church, which is supported by Tavistock Town Council. The guide will be among anniversary gifts on sale, including an anniversary mug. 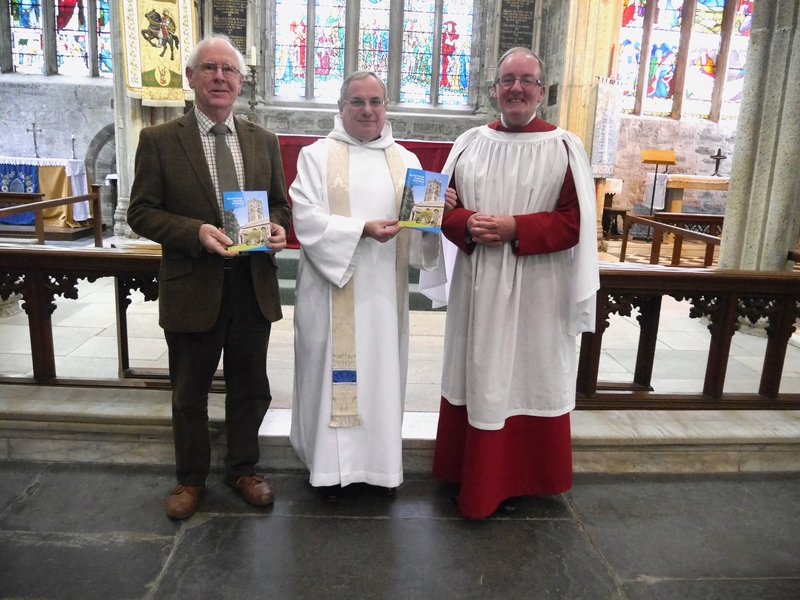 A new guide book on St Eusatachius’ Church has been published with the support of Tavistock Town Council. The full colour, fully illustrated book is being introduced by the church vicar, the Very Reverend Dr Christopher Hardwick, when the 700th anniversary celebrations are being launched at the Advent Carol Service, on Sunday 3 December. Vicar Chris is pictured with Ossie Palmer, church photographer (left) and Director of Music, Dr Sean Sweeney (right), who helped compile the book, together with Joan Torvell and Judy Hannaford Hirst. CELEBRATIONS to mark Tavistock Parish Church’s 700th Anniversary are to be launched at its Advent Carol Service on Sunday 3 December at 6 pm. The candlelit service of readings and carols will be festively set with 65 decorated trees. St Eustachius’ annual Christmas Tree Festival will be running from Friday 1 December to Sunday 10 December. With the support of Tavistock Town Council a new 700th anniversary church guide book is to be launched and the church’s plans for a year of celebration in 2018 will be shared. Lining up for the anniversary year is a full calendar of events, which will offer something for everyone. Besides the annual Tavistock Festival and Exon Singers’ Festival, it will include special services, visiting choirs, concerts, a lecture series, barn dance, quiz, the grand summer fete and much more. The Bishop of Exeter will be attending a service to mark the 700th Anniversary later in 2018.